Waveski Surfing is a dynamic sport combining the paddle power of a kayak with the maneuverability and performance of a surfboard. A Waveski resembles a thick surfboard, with a seat, fins, foot straps, and seat belt, enabling the rider to ‘Eskimo Roll’ if overturned. 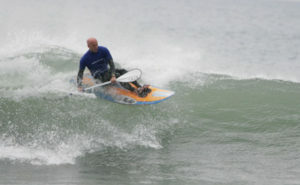 The waveski rider or waveski surfer then uses a double ended paddle for motion while seated on the waveski. Competitions are run similar to stand up surfing and are judged on the performance of the rider on the waves within a 20 min heat. High performance skis weigh about 6 to 8 kg and are custom made, using epoxy resin and EPS foam, which makes the waveski light & strong. The sport provides fun and exercise for beginners through to advanced riders. A waveski is not to be confused with a surf ski. 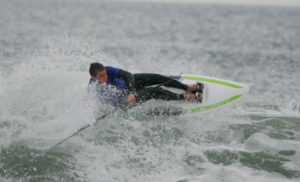 Waveskis are designed for surfing ocean waves and surf skis are designed for racing in open water. 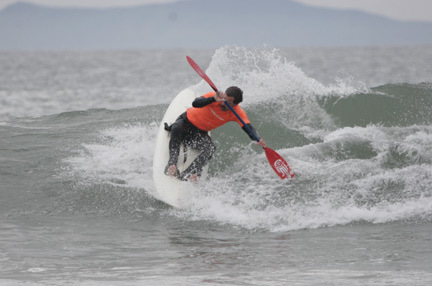 Some waveskis are ‘finless’ or ‘freestyle’ waveskis (often referred to as ‘Mervs’) were the pre-curser to the modern waveski. 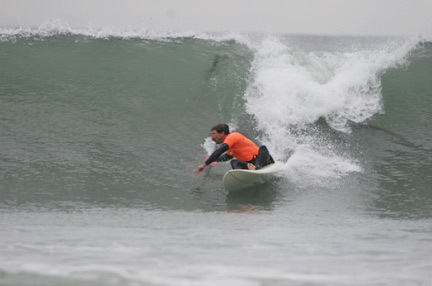 Originally developed by Merv Larson of California, finless skis are surfed slightly differently – often using a bit more flow, creativity and improvisation. The USWA was recently rekindled in 2007. Brian Kuszmar of Florida has been tirelessly working to revitalize the sport, organize competitions, and pump energy back into the community. Brian recently found himself the catalyst and driving force behind the organization of the West Coast Nationals for 2008, which was a tremendous success, with the help of Roger Adams and Warren Schultheiss). Warren Schultheiss has also donated his time (and expertise in web-development, marketing and graphic design) to build a new website, logo, community forums, blog and the overall identity for the new USWA. He is passionate about ‘youngifying’ the sport and is doing everything he can to help the sport grow nationally. The USWA also has a small temporary committee of passionate veterans that is occasionally convened for decision-making, and charting the course of the USWA. Part of the USWA’s goal is to promote an active and involved waveski community. This site is built with that in mind. With member feedback and assistance, this site will grow into an even more dynamic and helpful resource and home for the US branch of a larger waveski family.